Whenever we have fish on our dinner table, I’d feel it’s a very satisfying and rich supper, no matter what kind of fish we have. This dish is a super easy and quick one, yet delicious enough. 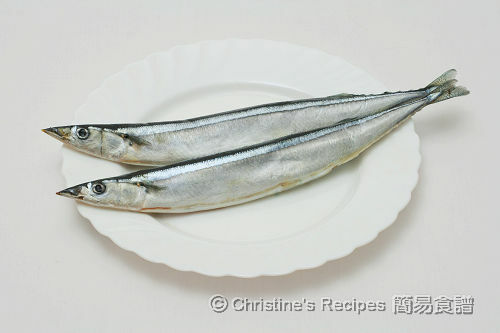 Sanma is commonly used in Japanese cuisine. To make this dish, all you need is an oven/grill. I used my toaster oven that is pretty quick to grill a small amount of meat. If you don’t have an oven at home, you can pan fry it oven medium-high heat. Both of the fish skin and bones are very crispy. You can eat the whole fish literally, given that you’re skillful and experienced in eating small fish with bones. Gut the sanma and clean well. Rinse, then wipe dry with kitchen papers. Generously sprinkle and rub with sea salt and pepper on both sides and inside. Season with assorted chili pepper. Preheat a toaster oven at 160C/320F. Line a baking tray with aluminum foil or baking paper, greased with a bit of oil. Place the fish on the lined baking tray. Bake in the preheated oven for about 15 to 20 minutes, or until cooked through and the fish skin becomes lightly brown. Serve immediately. Sprinkle more assorted chili pepper if you like. The fish goes very well with soy sauce, or Worcestershire sauce. Enjoy! You can grill the fish in a conventional oven at 200C/395F. Or fry the fish in a frying pan. Needless to add too much oil, as the fish would release oil while baking/grilling. Very nice. Did you buy the fish fresh Christine? 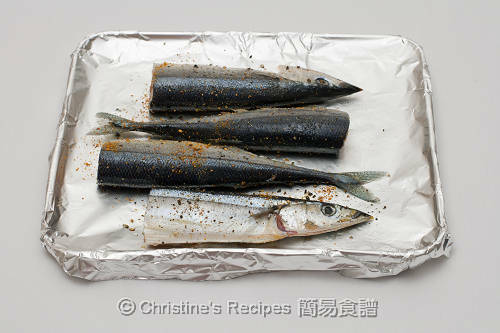 Your grilled sanma looks perfectly done and still intact....if I am to attempt grilling fish, I don't think I could get this results lol! I want to try this...should be much cheaper if we DIY! The other day I met a vietnamese family who were fishing at a pond nearby in a college campus and they had just caught a big catfish. Which made me think of getting s fish and grilling it, so your post is so timely. 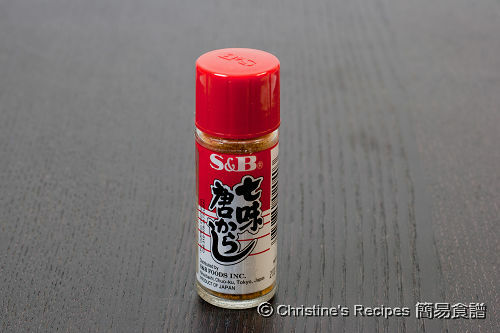 I use a different brand of this chili pepper but I absolutely like to use this Jap. 7-spice in my cooking. 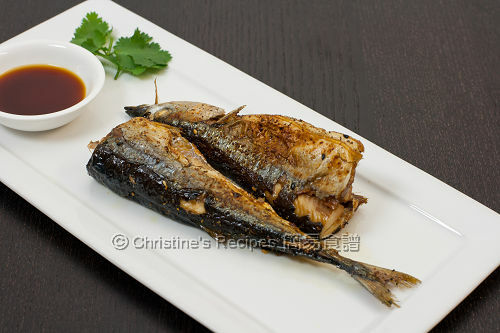 I love your grilled sanma and the addition of the chilli flakes. I always have a bottle in the fridge too. Love this fish as well and good to know that even a toaster oven can do the trick..thanks for sharing! Thanks Christine! 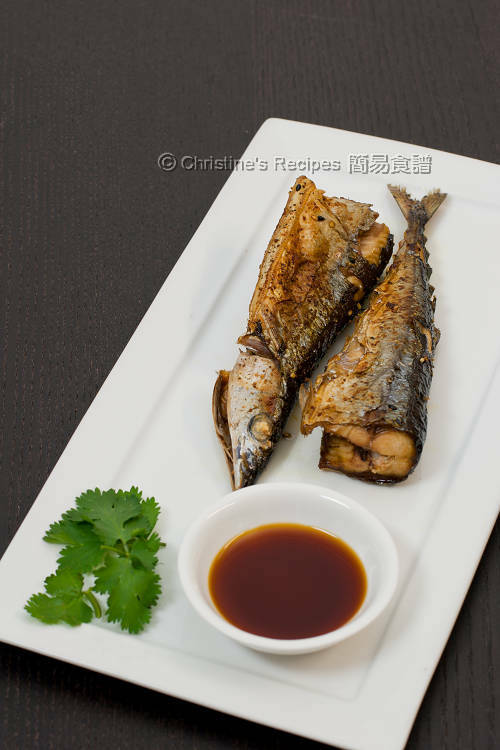 Where can I buy sanma fish? Can I use this recipe to make other fish? Where do you live? Here in Brisbane, I can only get sanma from Sunnybank, because supermarkets don't stock any of this kind of fish at all. Christine I live in Melbourne and I haven't seen this type of fish in the fish shop or supermarkets. Maybe need to try fish market? Or can you suggest another type of fish that may work well with this recipe? Thx! I couldnt find sanma fish at cold n storage in singapore. could you suggest for other fish? What is the precise steps to get the fish skin to be crispy? I have tried exactly the same steps as you mention but no way close to your picture. If i put the fish in over for 200C even for 10 mins .. the fish became overcooked. Can you share what is the tricks here? If you pan fry the fish, it's much easier to control the heat and use oil to fry the skin to be more crispy.